There’s a huge show coming to Metro Manila on May 2010, and it’s called the THEN AND NOW Massive Music Festival. Flying in from the United States are JoJo, Diana King, Frankie J, Baby Bash, P.M. Dawn, SWV, All-4-One and V Factory— each and every one of them performing their greatest hits onstage for all their fans in the Philippines. The THEN AND NOW Massive Music Festival is a definite all-hits show- not an album tour (where the artist/s only sing cuts from a new-released CD), or a promo tour (where the artist/s only push a couple of songs)- so music fans from all over the country can expect to sing and dance to their favorite tunes all night long. Word is, other international acts have taken interest in this once-in-a-lifetime event, so we might even be seeing more pop/R&B performers joining the lineup in the near future. To make things even more interesting, all sorts of prizes will be given away to lucky concert-goers, as we enlist the involvement of all sorts of music-friendly sponsors and partner companies, who also have a mind to make concert night a lot more festive and fun. 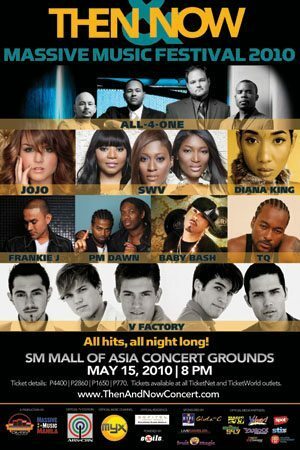 The THEN AND NOW Massive Music Festival 2010 featuring JoJo, Frankie J, Baby Bash, Diana King, SWV, P.M. Dawn,All-4-One and V Factory happens on a Saturday, May 15, at the SM Mall of Asia Concert Grounds. Tickets are available at Ticketnet and Ticketworld outlets. May 1st, Saturday – Contest officially starts. May 13th, Thursday – Contest ends.